Last night I got to the bottom of a pile of DVD’s I’ve been working my way through, and it really was the bottom. 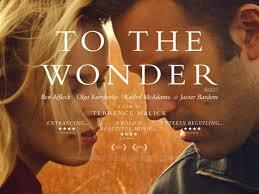 Terrence Malick’s To the Wonder is dull, disjointed, pretentious twaddle. Even the big name cast – Ben Affleck, Rachel McAdams and Javier Bardem – look disinterested and confused about what they’re meant to be portraying. Some critics have described To the Wonder as a Malick masterpiece. For me it is up there with Mulholland Drive and last year’s dreadful Snowpiercer as one of the most unsatisfying movies of the modern era. Interestingly, the men behind each of those movies have been acclaimed as leaders in their fields, brilliant story tellers gifted with the talent to marry those stories with the most incredible images. But I’ll leave those exhortations to the besotted critics who don’t dare break rank for fear of ridicule by their peers. Terrence Malick has made a real stinker – To the Wonder gets one star, and went out with this morning’s garbage. ← Want to attract the attention of Thai law enforcers?